Richard Levine/AlamyPandora promoted itself on Wall Street for its 2011 IPO. 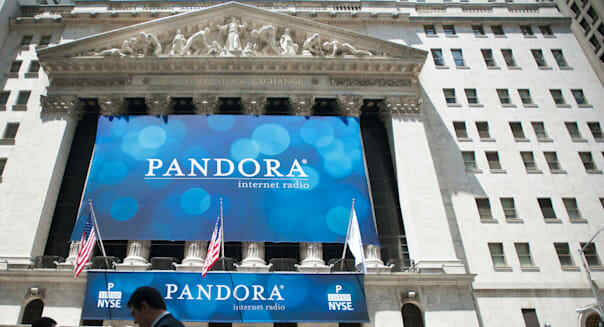 Pandora (P) shareholders weren't singing a happy tune in 2014, but now it's time for a new song. The leading music streaming service reports quarterly results on Thursday afternoon, and after the stock shed a third of its value last year, there's nothing like fresh financials to turn market sentiment around. It won't be easy. Subscriber growth has been slowing, and the competition is getting smarter. Wall Street's skeptical: The stock fell another 7 percent in January. Analysts are holding out for a big step this time around. They see fourth-quarter revenue of $276.3 million, soaring 38 percent from the prior year's holiday quarter. Pandora's expected to crank out a profit of 18 cents a share, up sharply from the 11 cents a share it served up a year earlier. Another encouraging sign is that it has beaten Wall Street's profit targets consistently over the past year. The stock may not have rewarded those positive surprises through 2014, but the trend seems to suggest that Pandora will earn more than 8 cents a share on Thursday. Double-digit growth on both ends of the income statement will be welcome, but that won't be enough to turn around a stock that has plunged 40 percent over the past 13 months. The biggest concern at Pandora -- its slowing subscriber growth -- needs to be addressed. Pandora had 76.5 million active monthly users as of the end of September. That's well ahead of the competition in this country, but it's only 5 percent higher than it was a year earlier. The news is better once you dig beneath the surface. Those 76.5 million music buffs are relying more on Pandora to fuel their daily soundtracks: It served up 4.99 billion hours during the quarter, 25 percent more than it did a year earlier. It's also seen its share of the overall U.S. radio market grow from 7.77 percent to 9.09 percent over the past year. We're also seeing Pandora doing a better job of milking more money out of its streams. Revenue for its third quarter climbed 40 percent, in line with the 38 percent that Wall Street pros are eyeing for the fourth quarter. Everything seems to be coming together for Pandora. Subscriber growth may be decelerating, but it's becoming a stickier app for its still-growing fan base as it coaxes marketers into spending more to reach those listeners. The problem, clearly, is that investors are concerned about where Pandora will be in the future. It's not just Pandora gaining ground here. Spotify announced last month that it now has 60 million active users, with 15 million of them on board as paying subscribers. Pandora has a wider audience, but fewer premium members since the vast majority of its listeners put up with ads to enjoy free access to the platform. The big names of tech are also storming the castle. Apple (AAPL) is experiencing a slide in iTunes download sales, which led to the 2013 rollout of iTunes Radio and the 2014 purchase of Beats Music. It's now a big player in streaming music. Amazon.com (AMZN) is giving its Prime members streaming access to a growing catalog of commercial-free tracks. Microsoft (MSFT) and Google (GOOG) (GOOGL) have also launched streaming music platforms, realizing that it's a big part of the mobile revolution. Google last year bought Songza as another way into the sector. Pandora's audience will be tempted by the growing array of alternative services. The company will have to prove on Thursday that it's kicking off 2015 with momentum in its corner. Motley Fool contributor Rick Munarriz has no position in any stocks mentioned. The Motley Fool recommends Amazon.com, Apple, Google (A and C shares) and Pandora Media. The Motley Fool owns shares of Amazon.com, Apple, Google (A and C shares), Microsoft and Pandora Media. Try any of our Foolish newsletter services free for 30 days. Check out our free report on the Apple Watch to learn where the real money is to be made for early investors.